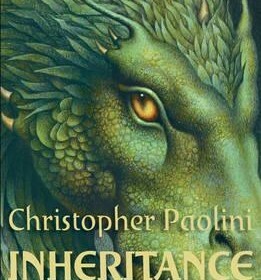 “Wind howled through the night, carrying a scent that would change the world.” Inheritance, by Christopher Paolini, is a book unlike any other with its twists and turns that no one could have seen coming. Inheritance is written in a first person perspective that switches between two of the main characters and their two separate but intertwined lives. Eragon, a spell casting dragon rider with a big heart and many regrets, and his cousin, Roran, a fearsome hammer wielding warrior whose devotion, determination, and cunning are unmatched. Together, they fight a desperate and seemingly hopeless battle against the Empire and the evil king, Galbatorix who betrayed the order of the dragon riders of which he was a member. He killed almost all of the riders with the help of his followers, the Forsworn, and proceeded to exert complete dominance and control over the land with his immense power. The two cousins face overwhelming odds, as they conquer cities, fight the king’s powerful servants, and travel through the land of Alegaesia, trying to find the source of the king’s power. At the same time, they try to find a way to save the race of the dragons, of which there are only two left, or so they think. They are aided in their mission by friends, allies, and mentors. Whether strange and mysterious or friendly and likable, they all strive to defeat the king until the surprising climax that only the most attentive readers could have predicted. This book was more complicated than other works by this author and other works in this series. The story would switch between the two story lines at seemingly random intervals, and this could be slightly confusing at times. Also, it could also make it hard to want to keep reading as every time it would switch, diving back into the tale could be difficult. There are partial themes of love and friendship but throughout the story there are darker themes of loss and fear, along with uncertainty that correspond with the equally dark tones the author uses throughout the book. I would recommend this book to people over twelve who enjoy fantasy and who can devote time and focus to reading this book as it requires both. Focus was especially crucial, as the two story lines occurring simultaneously could become immensely confusing to those who just skim the pages and do not take the time to fully comprehend what is occurring.